Before the season began, the series against the Angels, Astros, Indians, and Red Sox all in a row were marked on the calendar as perhaps the toughest stretch of the season. In last week’s edition, the alternate universe Yankees took two of three in Anaheim to start strong. The real-life Yanks swept the Angels. This past week, the real Yankees took care of business against Houston and Cleveland, winning both series. 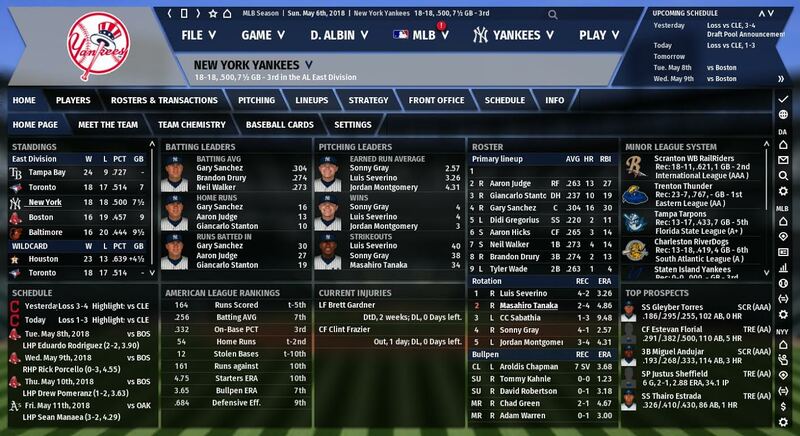 In our virtual OOTP world, however, things couldn’t have gone much worse. The Yankees and Astros began their series tied in the standings at 17-12, with both teams positioned in Wild Card spots. Houston was shorthanded for this series, missing Carlos Correa and George Springer because of back and wrist injuries, respectively (both players are expected to return in June if you’re curious). Meanwhile, no Giancarlo Stanton for the first three games of this series after the brawl last week. Despite a thin Astros team, things got ugly. Shield your eyes! The series opener was a low scoring affair, as one might expect when Justin Verlander pitches with a depleted lineup behind him. Yet, Verlander wasn’t dominant even though he only allowed a singular run in five innings. Jordan Montgomery was mediocre for the Yanks, allowing three runs in five and two-thirds (one run was an inherited runner allowed to score by Tommy Kahnle). In the ninth inning, AJ Hinch called on his closer Ken Giles for the save. After three batters, Hinch had seen enough. Giles recorded one out but allowed two baserunners, so in came Will Harris. The Yankees tallied two more knocks and a run to make it 3-2, but Harris managed to hold on for dear life by inducing Aaron Hicks to fly out to end the ballgame. Unlike real life, Luis Severino wasn’t dominant in the second game of the series. Sevy surrendered four runs and couldn’t complete four frames, putting the Yankees in a hole quickly. For Houston, Collin McHugh’s only blemish was a two-run homer off Aaron Judge’s bat in the third inning. McHugh lasted six frames before the bullpen shut the door, including a clean inning by Ken Giles for the save. The Yankees didn’t fare any better in game three. 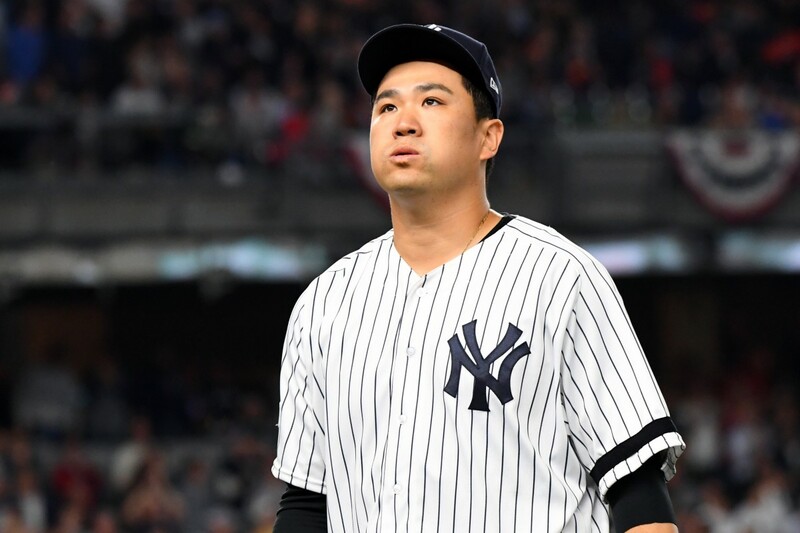 Masahiro Tanaka was torched for six runs, all of them coming on two three-run shots by Evan Gattis and Yuli Gurriel. He exited after three in favor of Domingo German. Unfortunately, German allowed five more to score in three innings of relief. The Yankees’ offense mustered five runs, but that wasn’t nearly enough as the Astros cruised to an 11-5 win. After the game, two roster moves were made. First, German was optioned to Scranton and Jonathan Holder was summoned as the replacement. Second, Tyler Austin was activated from the disabled list and Billy McKinney was optioned out. CC Sabathia’s poor start continued in the final game of the series, yet the Yankees were still in good position to win. Up 8-5 in the seventh, Chad Green entered the game. When he departed, the Astros were up 10-8. Yuck. Houston tacked on one more against David Robertson in the eighth to make it 11-8, which was the final that sealed the sweep. What an atrocious series. On a positive note, digital Greg Bird began a rehab assignment! He’ll be back before the end of May. After a hideous series in Houston, the Yankees returned to the Bronx to face the 15-16 Indians. The opener was a closer game than the final score depicts. Up 3-1 in the seventh, Sonny Gray ran into trouble by putting two baserunners aboard to start the inning. Dellin Betances entered in relief and promptly loaded the bases by drilling Edwin Encarnacion. Miraculously, without striking out a batter, he escaped without allowing a run. The Yankees tacked on four more to make it 7-1, which was the final, but the tide could have changed in that seventh frame. The middle game of the three-game series was a battle of the bullpens. Both starters, Danny Salazar and Jordan Montgomery, couldn’t finish six innings, and Cleveland had a 4-3 lead when Terry Francona opted for relief. The Yankees’ bullpen was flawless, but unfortunately, so was Cleveland’s. Old friend Andrew Miller impressively struck out the side to finish this one. In the rubber game, Luis Severino had a chance to rebound off an awful previous start in Houston. He was better…but still not great. He allowed two runs in five and a third as Chad Green had to bail him out of a bases-loaded jam in the sixth. On the other side, Corey Kluber was magnificent. In eight innings, he only allowed one run (Aaron Judge solo bomb) and gave way to Andrew Miller with a 3-1 lead. Miller shut the door to end a 1-6 week for the Yankees. Sheesh. Didn’t want to read about the Astros and Indians crushing the Yankees? I don’t blame you. Good thing we have the real Yankees playing well. The virtual Yankees were swept in Houston in a four-game set and lost two of three at home against Cleveland. After ending last week five games over .500, the team is now 18-18.